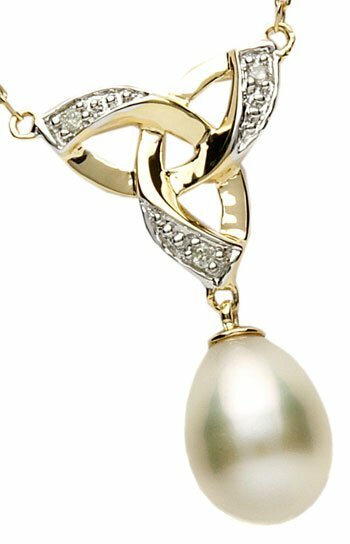 Beautiful 14k gold handmade trinity knot pendant set with diamonds and a pearl. Stunning 14k gold trinity knot pendant set with a pave of H/Si round brilliant diamonds and a freshwater pearl Measures 26mm high and 13mm wide and comes fitted with with 18 inch gold chain. Handmade and hallmarked in Ireland.